Morning Glory & Off With Their Heads split tour 7"! 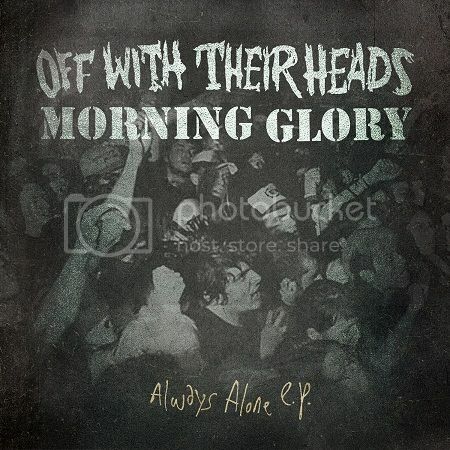 We’re stoked to announce a special split tour 7" with Off With Their Heads and Morning Glory! The 7" features new material from both bands and will be available exclusively at shows on their upcoming tour. Off With Their Heads deliver two songs including a moving cover of Morning Glory’s “Care of Me” and a rerecorded version of “Always Alone” originally off their sophomore album, Home on Epitaph. Morning Glory recorded the brand new track “Nationality Anthem” with Jesse Cannon at Cannon Found Soundation Recording Studios. Brian Viglione of Dresden Dolls and now Violent Femmes fame is featured on the drums. Ezra describes the song as “a rocker of a tune” with “a good universal, one world, one web, type message.” OWTH and MG kick off their December tour in Norfolk, VA on December 8th. Remember, this is a limited pressing (yes, it’s on colored vinyl! 2 colors in fact!!) and not available at stores, so don’t miss this tour! I’ve heard that Off With Their Heads are total jerks who don’t know how to play their instruments or drink. And Morning Glory are a bunch of softy wanna-be indie kids who need to stop listening to Barry Manolo and crying. So in the spirit of debunking myths we decided to do a split 7" with some brand new tunes. I for one can’t wait to go out, have some fun, and prove that only some of that is half true. Anyone who hears these new tracks will know both bands like to rock, drink and sing along.